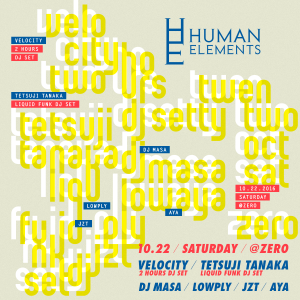 Long run musical / Soulful Drum&Bass night in Tokyo “Human Elements”. We had a amazing 10 years celebration party in August, we would like to thank you everyone who attended the night. This time, unfortunately our founder Makoto will be away, but the party is still going on with Tokyo’s finest local line up. We have Velocity who released his new “Jelly Break” recently and was 1st place at Juno Records vinyl sales chart, he also had “Night Owl EP” on our Human Elements label early this year. He will be playing exclusive 2 hours set this time. From famous Japanese DnB radio program “Localize” on Blockfm, Tetsuji Tanaka will be playing his 1st ever set at our party and exclusive “Liquid Funk Set”. We also have DJ Masa who won “Road to Outlook” in 2014 and is making regular appear 06s at Womb club and our amazing residents Lowply, JZT and new joining Aya.